An acquaintance of mine who is the mother of identical ten-year-old daughters shared a lovely story about her girls’ first sleepover. Since her daughters were previously reluctant to do sleepovers, the mom was pleasantly surprised when both girls expressed a keen desire to sleep at their friend’s house. The mother mirrored their enthusiasm about embarking on a new experience. Nevertheless, she was well aware that one of the girls might not make it through the night. When bedtime came, the friend’s mom called my acquaintance to tell her that one of the twins wanted to go home. 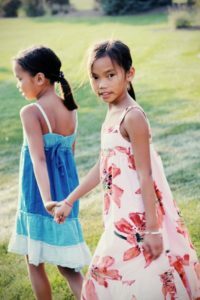 The friend’s mom mentioned that the other twin drew attention to her sister’s need to leave. My acquaintance was surprised because she had not sensed signs of distress or discomfort in the twin who wanted to go home. The twins’ mom cheerfully came to pick up her daughter. Nothing was said, and her daughter slept peacefully in her own bed—alone for the first time. The next morning, the two of them picked up the other twin at the friend’s house. The mom worried that friction might arise between the two girls. She worried that the twin who spent the night might deride her sister about going home. Thankfully, that did not happen. My acquaintance parents her daughters to be individuals. She is diligently attuned to their personality differences and regulates their experiences so that each girl is aware of her feelings and what she needs. The twin who needed to come home felt no shame or embarrassment. The mom was pleased that her daughter could honor her feelings and ask for what she needed regardless of her sister’s wishes. Just to be clear, these twins bicker constantly with one another. They conflict most when each wants to get her own way when they play together. However, in matters of individual strengths and differences, they demonstrate the utmost respect for one another. Recently, they received their report cards and naturally compared them. Even though one girl achieved considerably higher grades than the other, she made no taunts or critical remarks to her sister. Parents of singletons do not have to worry about these complex emotional issues when their children have not yet mastered being away from home overnight. The child has no one else to contend with except him- or herself. The emotional vigilance required to parent two same-age children is challenging. However, at the end of the day, these sisters’ respect for each other’s differences and strengths is testimony to their mom’s respectful management of their separate selves.